I hope I say this correctly, and with the dignity it deserves. Alzheimer's Disease is something I fear. I think it's a disease everyone is terrified of -- to not know who you are, where you are, or who's around you. I don't have Alzheimer's, but when I forget what I'm talking about, when I forget the names of things right in front of me, when I struggle to think of the right words ... even though I know it's because of neurological Lyme disease and can sometimes be reversed, it still scares me. It's not as simple as getting older; there's a definite difference between who I was three years ago and who I am now. Adding to the fear is I also know that people with neurological Lyme have a greater chance of getting Alzheimer's, ALS, Parkinson's, MS, and similar diseases. The brain is an amazing thing. It's also a mysterious thing. This year Julianne Moore won an Oscar for playing a woman with early-onset Alzheimer's in the movie "Still Alice". I read the book when it first came out, and I have to admit to crying while reading it. In 2014, Glen Campbell's documentary "Glen Campbell...I'll Be Me" was released. His last song, written for the documentary, "I'm Not Gonna Miss You", was sung last night at the Oscars by Tim McGraw. It's a poignant, gut-wrenching song about perhaps the one good thing about Alzheimers - if you don't know who people are, you can't miss them when they're gone. I write journals for my men -- one for my son, and one for my husband. I don't write every night, but I write about things I remember so I don't forget later. Things they did that day that made me happy, things we've done together that I hope I'll always be privileged to remember. There have been times in my life when I thought it would be better to end it. 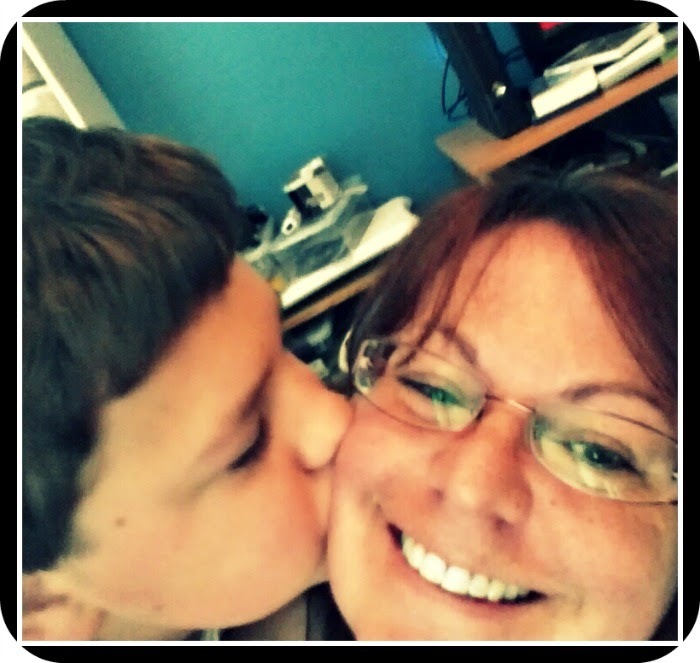 Lately, I've had some really good days, days that make me think my fight with Lyme is over ... and then I wake up and cry when I stand, grit my teeth until I get Zack to school, and come home to fall apart a bit. Then I take a deep breath and I write. I keep on. I can't quit. I may want to, heaven knows. I hate the rollercoaster life my family has to deal with; I hate being a burden (even when they say I'm not); I hate losing time. But I love too many people. And I love my life to much. I don't know what will happen but that's part of the thrill, and part of the fear, too. But I've been given this life and I'm going to see it through to the end. I respect people like Glen Campbell and Alice Genova. I respect how they're brought attention to Alzheimer's and to the people whose names we don't know and the people who care for them. If you are interested in learning more, are caring for someone with Alzheimer's Disease, or would like to make a difference, please take a look at http://www.alz.org/ . It's not just an "old person's disease"; it can affect people in their 40's and 50's. 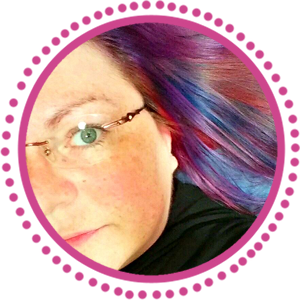 If you're interested in joining Heather and my Art of Awareness Blog Hop, the color for Alzheimer's Disease awareness is purple. You can learn more about the hop here and here. 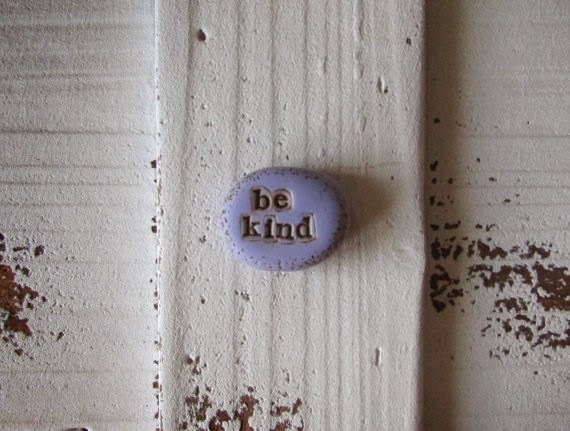 Your bead can include any word or name, and a customized awareness ribbon stamped on the back. I hope I've said what I meant to say (today isn't a "good brain" day, and it's one of the reasons why I don't blog nearly as often). I hope it's understood that the more people know, the more compassion can be shown, and even more importantly, a cure can be found. It's out there. Someone just has to find it. The Art of Awareness -- So You're Having a Hard Time Picking a Cause? We Can Help. 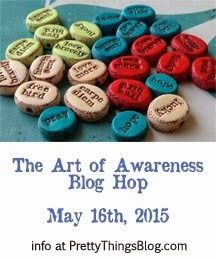 My last post was about the Art of Awareness Blog Hop organized by myself and Heather Millican of Swoondimples. Some people have contacted us and said they're having a difficult time picking a cause, as, if you look at this list, you can quickly become overwhelmed. I dare say we've all been affected by more than one thing on that list, so here are some things that can help. First, I want to explain the purpose of working with Heather Millican and the purpose of the hop. 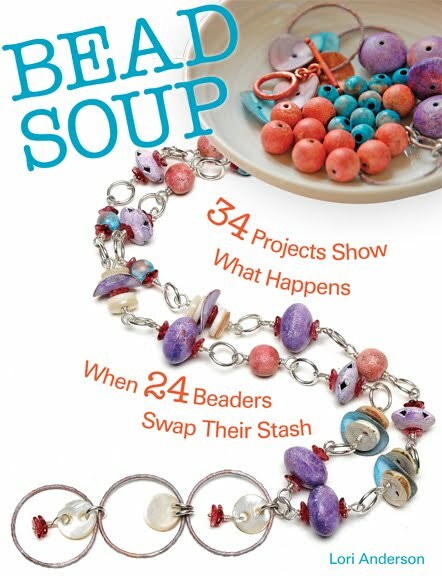 A few years ago, I had a monthly design challenge called Cup of Bead Soup, which was a riff off my popular annual Bead Soup Blog Party. 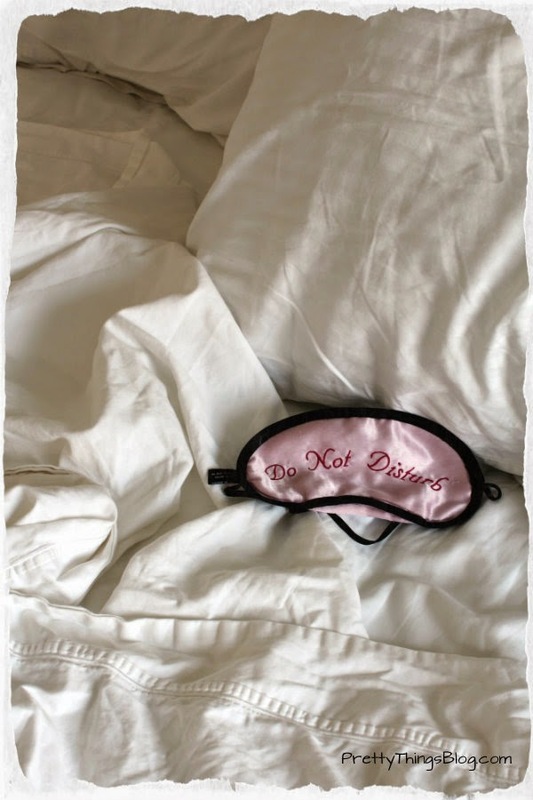 This year, I didn't feel up to doing the hop, as after eight years (with some years involving three hops up to 500 people), I felt I needed a break, the hop needed a break to freshen up, and I needed to have time to put on other blog hops I'd dreamed up. 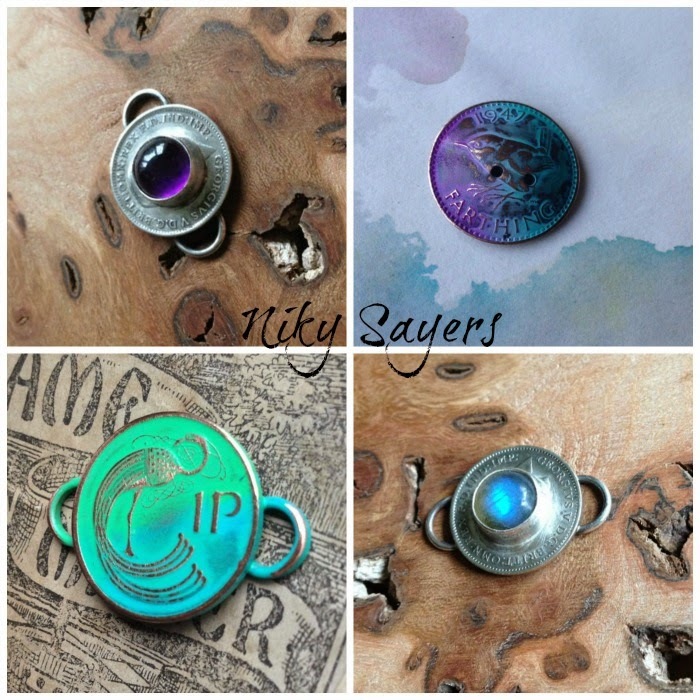 Each month, a new artist of handmade beads offered a small set of their beads, there was a random drawing, and the winner paid the artist and created something that we'd all show on blog hop day. It was a great way to see how different minds thought about things even when given the same beads, and it promoted handmade. 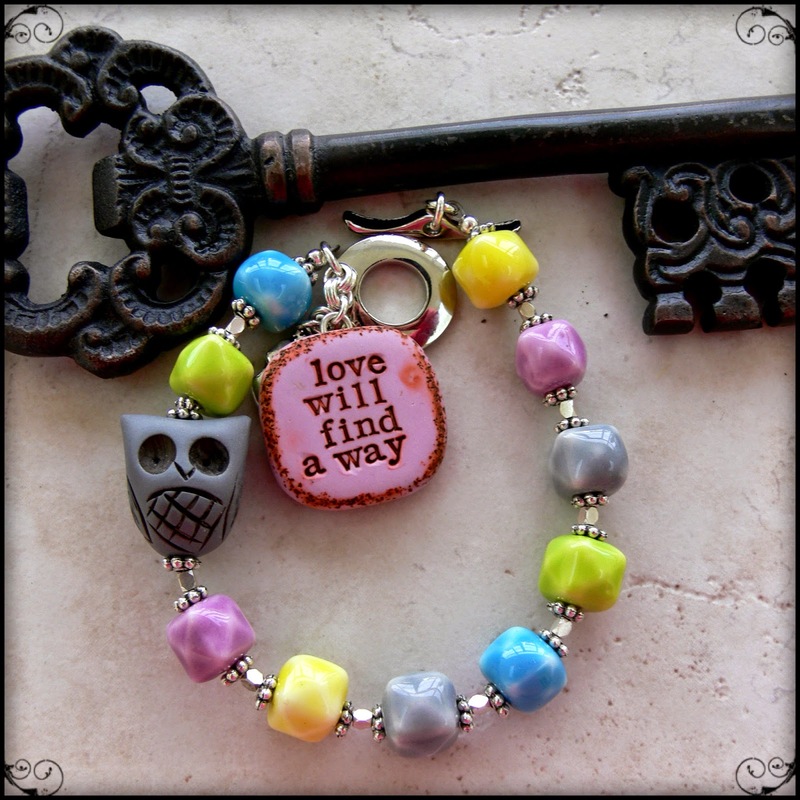 A word bead by Heather Millican and an owl by other favorite clay artist, Barbara Bechtel. Some people have requested beads that have a color with a specific meaning to them. That is totally fine! I seriously doubt anyone has that long list memorized, and you should make an awareness piece that is meaningful to YOU. If you need to be reminded to be gentle to yourself, choose your favorite color and word. If you have breast cancer and are sick to death of pink, choose your favorite color and a word that mean something, like your child's first word. 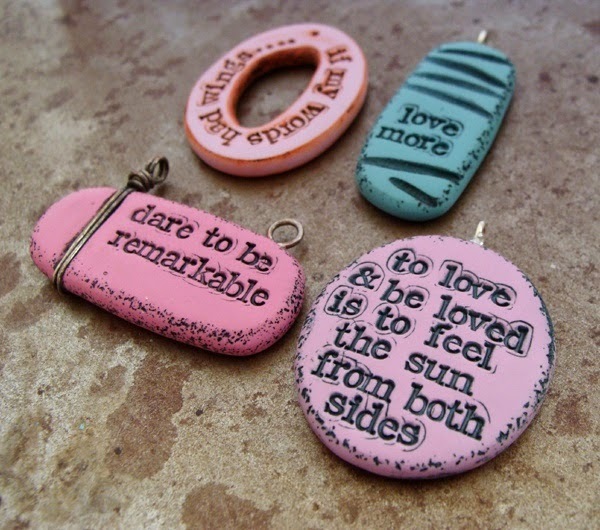 Awareness jewelry doesn't have to mean just awareness of an illness or syndrome. Believe me, we're all aware of something that has changed our lives! 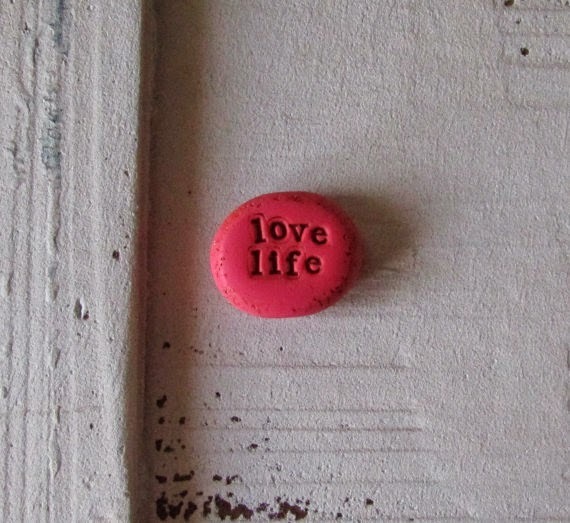 Think of this blog hop, this jewelry challenge, as a way to celebrate a life, to honor a person's key word, to create something that makes you smile when you see it. I hope this explains things better, and I hope it encourages you to try the challenge! Again, if money is an issue, please message me on Facebook. I've saved back some money so that anyone who wants to do this project can. To keep things simple, Heather and I chose her word bean beads. However, if you have burning desire for something different, please feel free to contact her and discuss it with her. It will take more time and have an additional cost, but she treats each customer with care and empathy. To sign up, click here, and at the bottom of the page is the link for the sign up form. On February 25th, I'll list the participants and their blogs or Facebook accounts, so you can have fun exploring new places and learning about new people. Heather and I hope you'll join us! 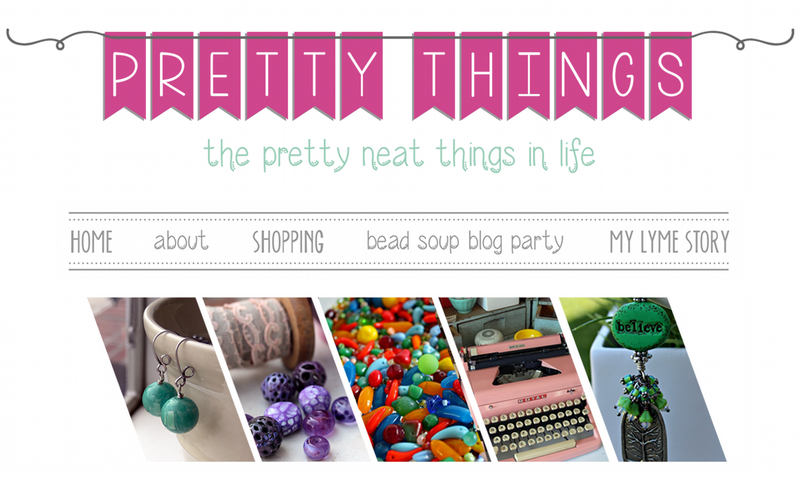 I am so excited to bring to you a new blog hop with my friend Heather Millican of Swoondimples. 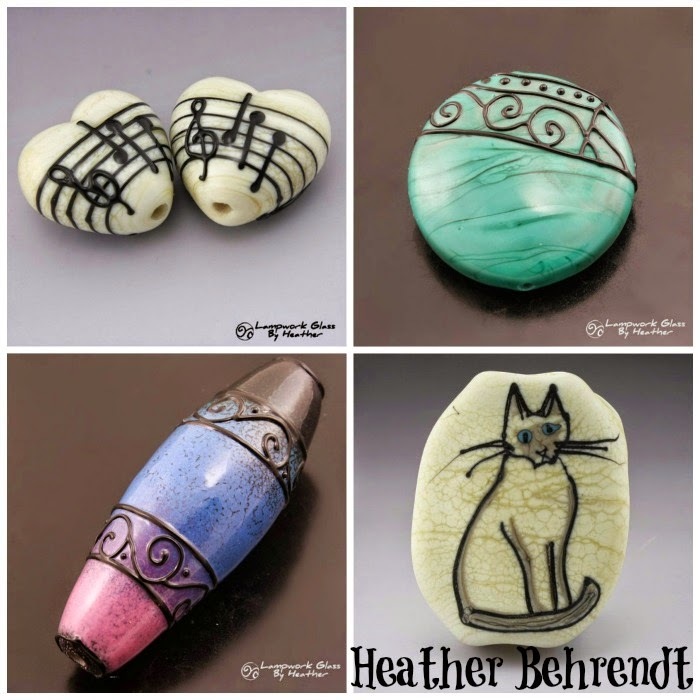 I've been a fan of Heather's polymer clay work since my first trip to Bead and Button ages ago. 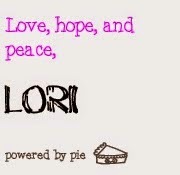 I love this one -- it's my awareness color, and such a simple but powerful word. 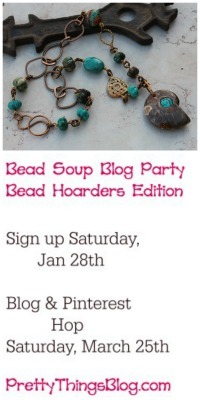 For the past few weeks we've been hammering out the details for this very special blog hop and I hope you'll join us. leading you to a form to fill out for participation. Please be sure to fill it out or I won't have your information for the blog hop! And remember, you need to use one of Heather's beads to participate. 1. Visit Heather's store by clicking here. 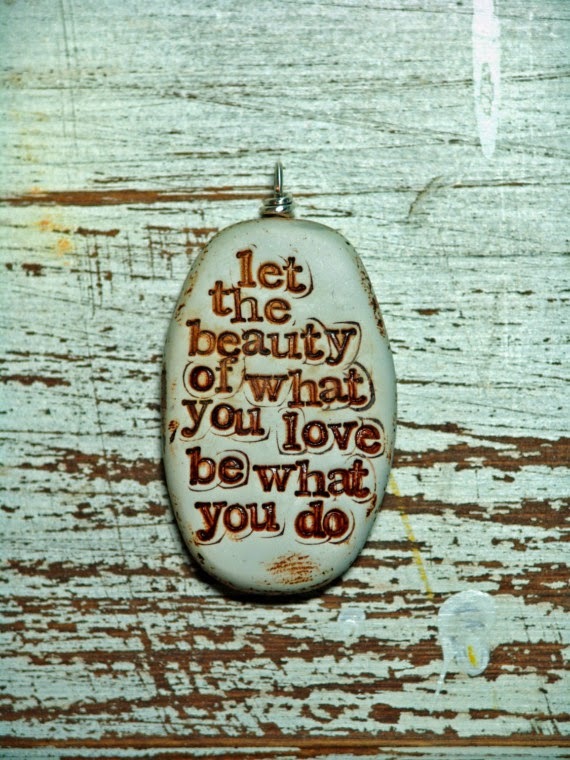 and let her know the word you want on your bead. For information on awareness colors, click here. 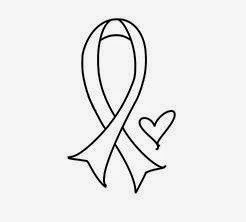 One side will have a custom-designed awareness ribbon stamped onto it. 3. Each bead is $12 plus shipping. You only need one, but can order as many as you like. and feel free to tell us the story behind it, if you like. 5. Upload the button below to your blog. Don't have a blog but want to participate? It's OK to use your Facebook link! And let your friends and groups know about the hop! As everyone's blogs are different, you may need to resize the photo to fit. :: First, left click the photo above and save it. :: Choose "Add a Gadget"
This will lead people to this specific page for more information. Sign ups will stay open until February 24th. 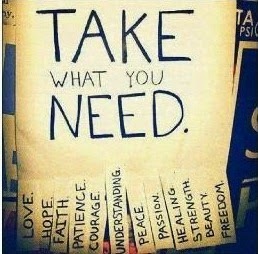 and hope it's meaningful to you. Time to make some people smile! Be kind ... it's catching. As promised, it's back to beads today! I've been selling off quite a lot of my way-out-of-control stash, and will have photos available, but THESE are things I'm seriously crushing on and would keep safe and sound like My Precious. I'd be happy with ANY flower she makes! Next is the ever-evolving ceramic art of Gaea. with these, which I surprisingly don't have. 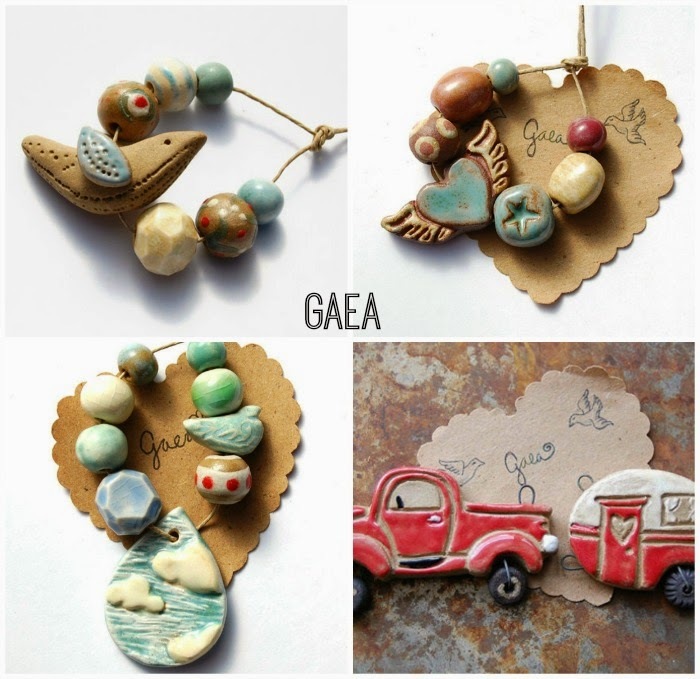 You can find Gaea's work here and here. She has a coupon code, too! "BEADLOVER" for 10% off at check out until February 28th, 2015. I really need to get those music note beads. Her coin pieces are amazing!!! who make their own pieces by hand. Let's give them some support! 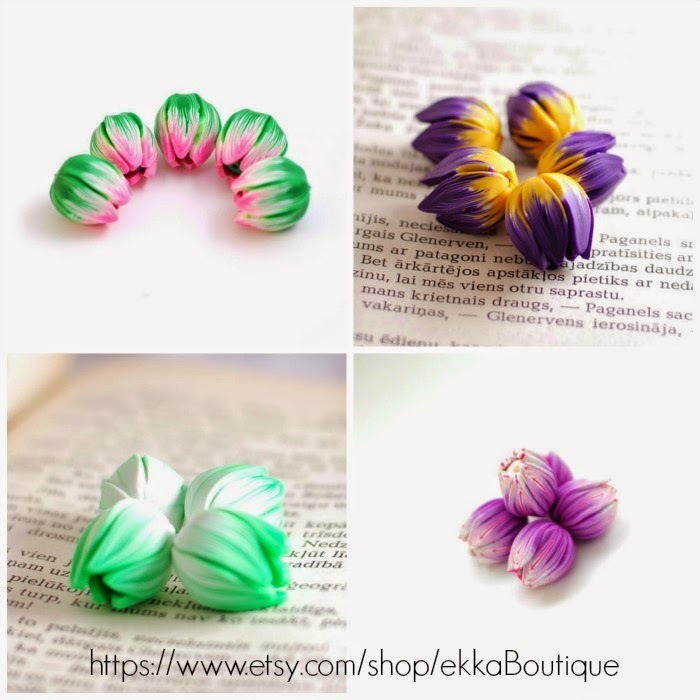 Another installment of Etsy Finds will be coming soon! Smiling through the nausea! So far, so good! With my best boys, listening to our new favorite artist, Hozier. I may fall asleep during part of the ride, but it's OK. I'm with friends. National Drug Week has just passed and American Recall Center brought to my attention a number of thing, including how to understand your medications and their side effects. To me, the two go hand in hand, and I'd like to share some of my experiences with juggling 30+ pills a day. They had read my post about my Spoon Theory spoon asked if I'd write my thoughts. Most of you who have visited my blog know I suffer from lyme disease (misdiagnosed as lupus for a year) and the coinfection babesia. Being treated properly for these two nasty diseases is daunting. I feel fortunate I was able to find a doctor who knew what tests to run, lucky that I had the money to have independent labs run complete blood tests, and extremely glad I have an understanding husband and son, because the past two years have been a really ... interesting experience. 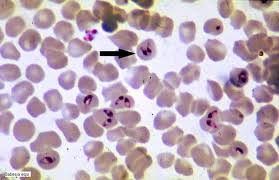 babesia bacteria infecting red blood cells. source. 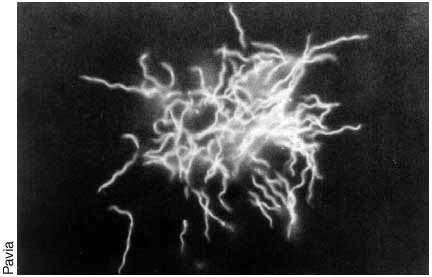 lyme bacteria in spirochete form. source. 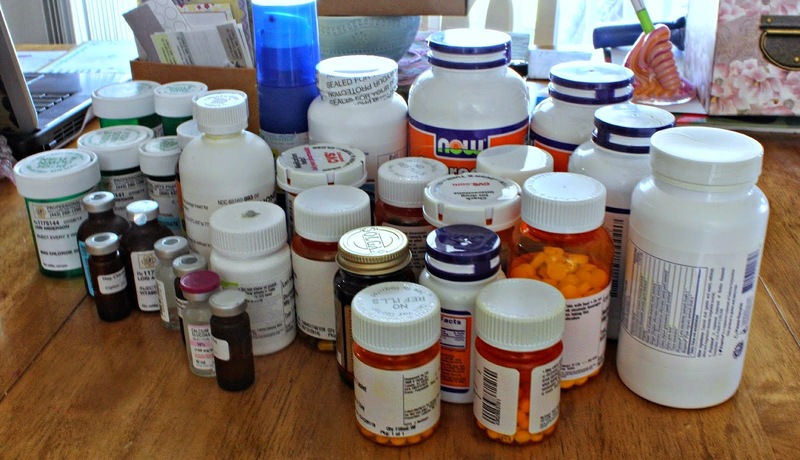 The first year of my misdiagnosis, I was given a lot of different medications for lupus and rheumatoid arthritis (the latter of which I do have, but is under control today). 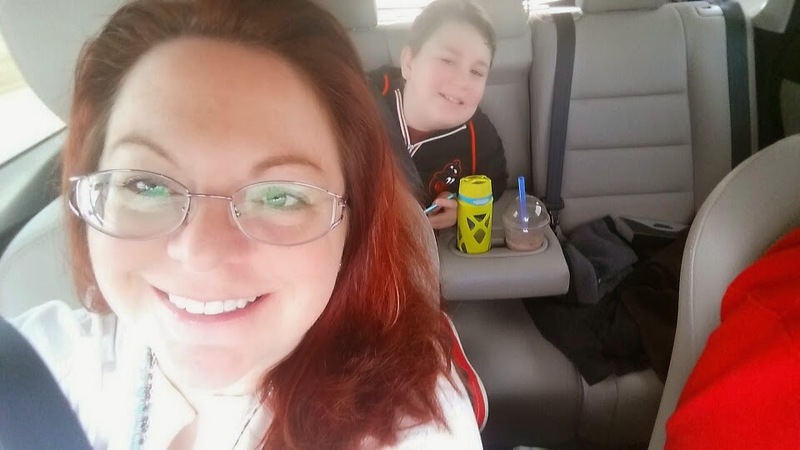 No matter what meds the doctors gave me -- prednisone, methotrexate, whatever -- I was still in enormous pain and was incredibly tired, so tired it no longer felt safe to drive. First I was given Tylenol-3, and as my body grew a tolerance to each new pain reliever, I finally was prescribed slow-release morphine, which I took for a year. Something my pain management doctor told me (and any good doctor will tell you) is you have to weigh the reality of becoming addicted to the pain medication against living in pain. For a little while, the morphine helped. I also had a muscle relaxer to help with the intense body pain. That sometimes helped, but rapidly became ineffective. Very quickly, I realized it was doing me more harm than good. Morphine has a bad habit of causing rebound pain. At first, it was doing a good job of keeping my pain dialed down to a Level 5 instead of my normal Level 10. It was time to detox off the bad stuff, and while it took a little over a month and was one of the most difficult things I've ever done, once I was off morphine I was in no worse pain than before. The morphine had done its job for a while, and it's not a decision those in serious pain should make lightly, but for me, it was the right move. Opiates have their place, but they can mess you up if you're not careful. Several times, I nearly overdosed because with the brain fog of lyme I often couldn't remember if I'd taken it or not. So I'd take it again. And again. When you take too much of anything (even chocolate! ), it's bad news. When you take too much of a high-level opiate, you're asking for serious complications, or even death. Opiates slow your breathing down, and I already had issues with the lyme affecting my heart and lungs. I also have asthma. And of course, I was lying down almost all the time, so my heart wasn't working at normal capacity. Put that all together, and you get a girl who can't wake up. My husband Rick very quickly took charge and locked away all of my pain medications so I would have to ask him for one, and he kept track of when I took them. 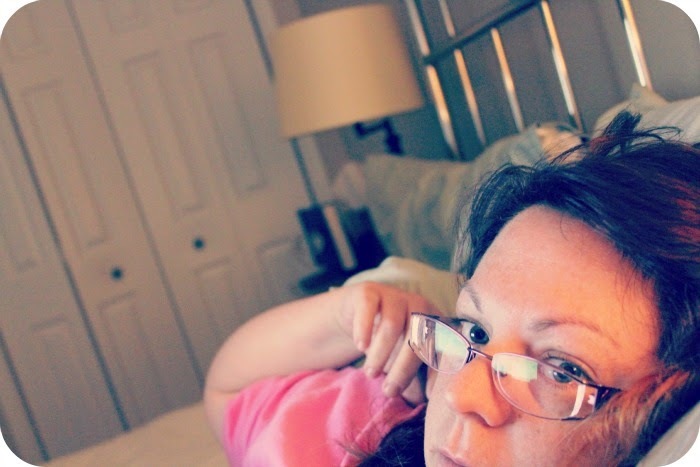 He also started researching what I was taking and realized that since I had several doctors trying to treat several different things, I had a potential for a nightmare on my hands in the form of bad drug interactions. I highly recommend that you have a significant other take control of your medications while you're in a less-than-normal state. It saved my life, and it can save yours (not to mention pills away from any children in your house). Taking control of my medications in this way enabled one doctor to see what another doctor was doing and make changes or suggestions of things that would help what THEY were giving me work properly and with a minimum of side effects. Our local pharmacist knows us by first name, and they keep an eye out as well. But do your research. My current pill, liquid, topical, and injection med load (in part). An important thing to keep in mind about your pharmacist is your bottle of medicine can only hold so many warning labels. When I started realizing my refills were coming to me with different labels than before, I knew Rick and I had to read up on each and every medication. Your pharmacist is your friend, so don't be afraid to ask them about additional side effects you should know about, as they have a listing of all the prescription medications you take. Don't forget about supplements, too. Some, like magnesium and calcium, can mess up several of the pills I take, and if you take a probiotic (a great way to keep a healthy gut), you can't take it within several hours of an antibiotic, or the antibiotic kills the good bacteria you're trying to ingest. Finally, a word about what to do when the bad happens and you mix two medications or supplements that give you a horrible side effect. Any side effect that is out of the norm should immediately be reported to your doctor. Some medications will cause you more harm than good if you stop taking them without a doctor helping you counteract new side effects. My personal experience has been an interesting one. We discovered that two pills when taken in close conjunction gave me hallucinations. That was rather frightening, to say the least. Detoxing off morphine while still taking other meds I was used to taking caused what felt like seizures and prompted a quick trip to a neurologist. I got the shakes and fell andI have eye problems, but these side effects were finally determined NOT to have anything to do with my pills, but with the disease itself. Quite a long post, I know, but if you've come this far, I hope you feel it was worth your time! Thank you to the American Recall Center for asking me to participate in their campaign, and healthy living to all of you. Tonight Zack and I both are feeling a ton better, and we worked together on a class project that his infinitely creative English teacher devised. It's not your basic book report -- oh no. 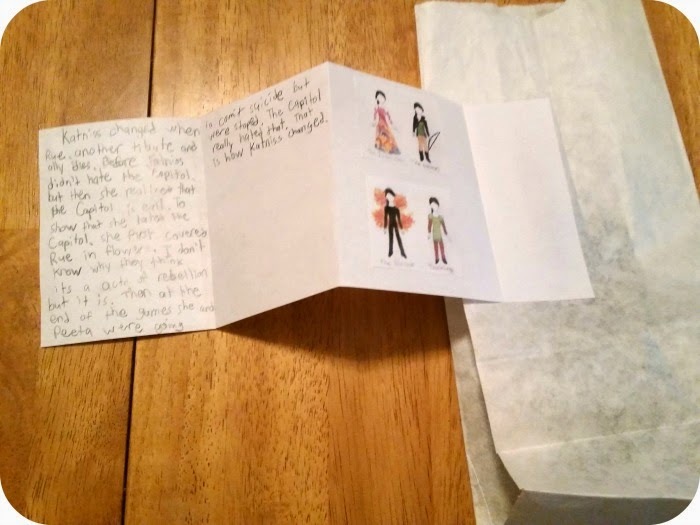 She gave the kids a white paper lunch bag, told them what topics to write on each side, and instructions to put five things into it that represented the book. 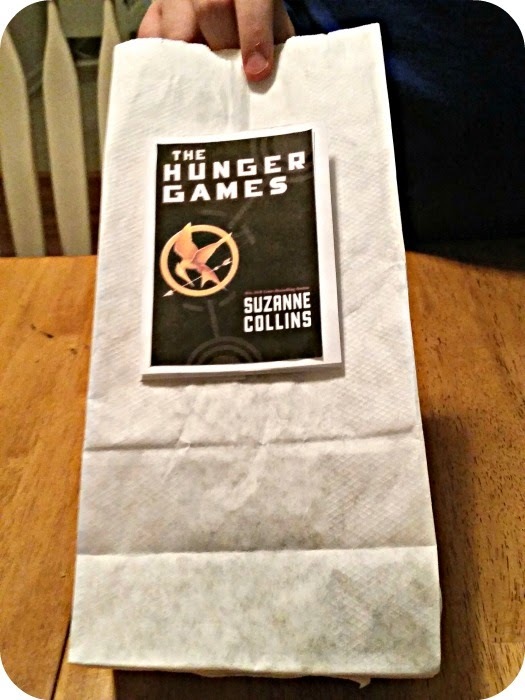 On the sides of the bag were written key points of the book. On the front and back, he needed an illustration and a synopsis of two character traits of the character he chose. Inside the bag, he needed five things things that also represented the book. On the back, he opted to make an accordion-fold booklet to write his synopsis. He was nervous that he'd mess up the bag if he wrote on it and had to erase, and he liked the idea of having something a little different. Then the inside of the bag. 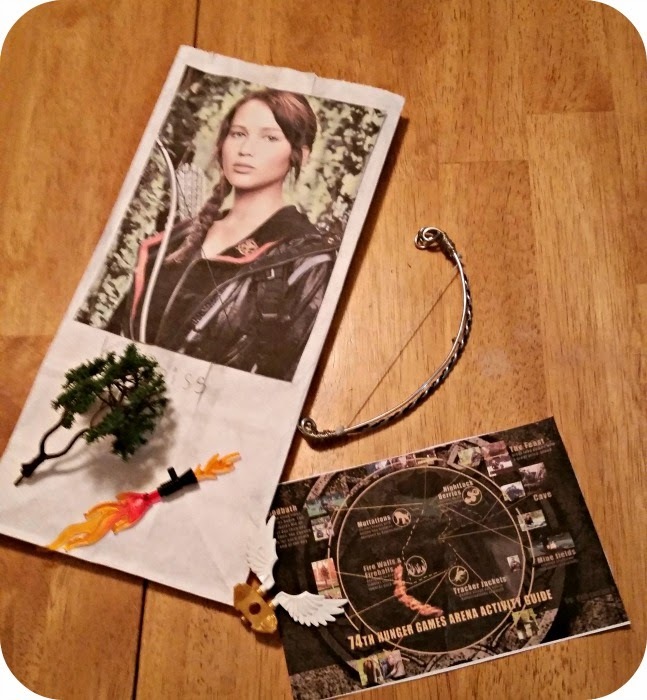 He dug into his LEGO collection and made flames, wings to represent the Mockingjay pin, a tree from a railroad set, a map of the Arena, and a bow that I made for him out of wire and waxed linen. He's pretty happy about the bow. He picked out a twisted craft wire of black and silver and 14 gauge silver wire for either side. I used 26 gauge wire to weave the ends together and made it sturdy, and then used a piece of waxed linen for the string. We decided to use waxed linen instead of anything springy because the last thing we wanted to do was create an inadvertent weapon that could be used to flip things across the room like a sling shot. So far Zack has read the first two books of The Hunger Games trilogy but is taking a break before reading the third one because while dystopian, post-apocalyptic literature is very creative, it's also very intense. I do the same thing when I read intense books; stop for a break by reading something completely unrelated. Now he's ready for his report on Thursday. You go, Zack. You've got this.